With the US elections coming very close, it is time to comment on the way that we, the non-US rest of the world, view it. I remember polls conducted in European countries 4 or even 8 years ago, according to which George W. Bush would never have been elected here. Now, after 8 years of a Bush administration that had quite some (hmmm, let's say not always positive) effect on the rest of the world, how would the world decide? Some youngsters in Iceland asked this question as well and came up with a world-wide poll on the internet. You can look up the results here. The result is overwhelming: 86.8 % for Obama! The world map that they plot is deep blue - meaning Democratic. 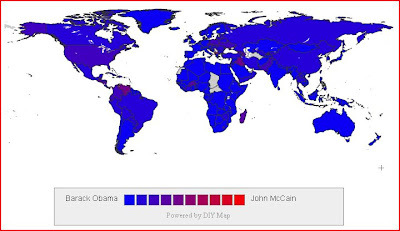 It is interesting to note that McCain has a chance only in some rather peculiar countries: Macedonia, Albania, Venezuela, Iraq (amazing - but with only 13 votes hardly representative), Georgia and so on. Are these people hoping that McCain could bring them freedom and democracy? Anyway, in the large western democracies, from where thousands of votes have been cast, Obama wins dramatically. For example Germany: More than 11'000 votes, 93.4 % for Obama. So, dear Americans, be assured that the world is watching you. And it has a clear opinion. Of course it does not count, but consider this: A president Obama would have an entirely new chance to change the world's view of the US. McCain might be able to repair the worst damage that Bush has inflicted on America's reputation, but hardly more than that. I shall have to bedevil Lubos about this. Does that not already tell you anything? And Georgia is no surprise. Folks, the choice is clear. President McCain it is. Western Europe is in the grips of a failed economic system. The redistribution of wealth doesn't work. class warfare isn't cool and it is suffering in the grips of socialism. What we really need is the flat tax (look at E Europe) But anyways ..
And I'0m a Democrat btw. Of course it counts. Just not at the polls. But symbolic value must not be underestimated. What is so special about Obama? Why could McCain not? It is sad..people don't see there are good and bad in both parties. Obama hardly would be any better than Carter's 1st term. In fact, he would be the extension of that. Obama is as establishment as we can get. Kerry? Pls. And this map is suffering from the Bradley Effect big time. If we really would have wanted change we should have selected someone with the experience to bring it about. Of course all campaigns made mistakes but being black, I'm sorry, is not a blank check to be president. It is a skin color, nothing else. What I find most worrying about Obama is to say and do anything (FISA, racism charges, public funding, ACORN..the list goes on) to be president. herein the question should not be what but, why? An egotistical maniac ..well, might be a cool trip I dunno. If we wanted name recognition, we should have chosen the Clintons. if we wanted someone to repair the economyit should have been the Clintons. if we wanted someone with global stature we should have selected the Clintons. Who is Obama? What the people's problem is I don't know. However, it could reflect the historical amnsia people are suffering from. But, anyway.. Global warming is real .. but not to the extent it has been made out to be. Mankind has worsened it for sure..nonetheless I believe it is natural in part, in its making, too. We should have a sound environmental policy yes.. but not be conservationist. And if we want real change we can start by eliminating K Street, getting rid of all the interest groups et al in Washington. Including the environmental ones. Refer to my blog for the enviromental policy. As to ..Gore.. look up Esoteric Agenda and you may be interested to see ..